The subject of small businesses came up in a number of sessions at Crain’s Future of the City of New York conference on Wednesday. In the final panel of the day, all the prospective candidates for mayor were eager to embrace the sector famous among other things as a leading engine of job growth. All agreed that New York’s small businesses face varied obstacles, ranging from excessive fines and double taxation and long waits for permits. All the mayoral wannabes also stressed that they would seek to address those hurdles. “Small businesses across the city of New York consider the city to be the enemy, and we need to stop that,” said Bill Thompson, the former NYC Comptroller. 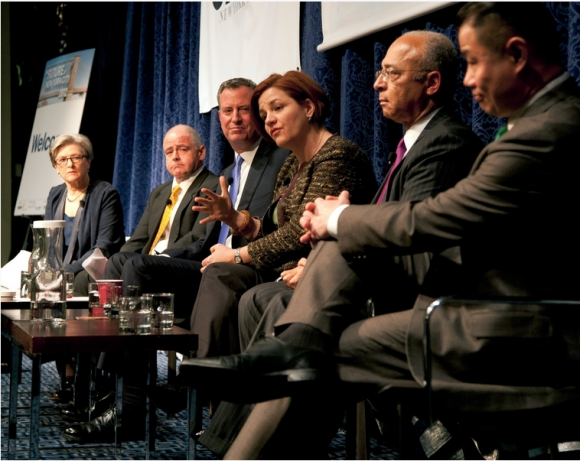 City Council Speaker Christine Quinn insisted that under her leadership, quite a bit has already been accomplished. She cited efforts the City Council has made to aid small businesses and freelancers but stressed that there’s still work to be done. “The most important thing is for small businesses not just to grow but to stay alive,” Ms. Quinn said. Meanwhile, the city’s current comptroller, John Liu, struck a similarly earthy note. He said small businesses in the city don’t necessarily want help from the city . “They just want the city to get out of their way,” he said. All the candidates made it clear that if elected, they would address the needs of small business, though all were a bit thin on the details. “I think the government has some serious work to do,” said New York Public Advocate Bill de Blasio. Small business owners in the audience had their own ideas about what needs to be done to help one of the city’s most important sectors—theirs. Yin Ho, founder and CEO of health information startup Context Matters, expressed some disappointment with the forum’s panel on media and finance, for example. She noted that many of the panelists talked about the need to make the city more attractive to people in their twenties. Instead, she wished there had been more talk about training and hiring locally. “If you’re talking about the future of New York, there has to be a community aspect,” Ms. Ho said. Speaking of local hires, CUNY Vice Chancellor for Student Affairs Frank Sanchez said that what is often overlooked is that a gifted workforce can spring from the city’s own public school system. “A lot of folks don’t think about the talent in their own backyard,” Mr. Sanchez said. Some attendees stressed that small businesses are important to the city, yet they face continuing difficulties in starting up. Ken Biberaj, vice president of Manhattan’s Russian Tea Room, said that small businesses have been hurt by the city’s tight regulations and red tape and asked that more energy be devoted to helping entrepreneurs opening up new businesses, something that would help boost the economy. “Small businesses are key to bringing in new talent and revenue,” said Mr. Biberaj, who’s also running for a City Council to represent the Upper West Side. Among other things, he noted that it is the individuality and uniqueness of mom-and-pop shops that add the color and flavor to the city’s neighborhoods that New Yorkers thrive on. “Nobody is moving to the Upper West Side because of banks and Duane Reade,” he said. This entry was posted on Thursday, November 29th, 2012 at 2:31 am. It is filed under Print. You can follow any responses to this entry through the RSS 2.0 feed.